Blues musicians tend to stick with the genre, in all its forms, and never stray that much from the idiom they were most passionate about in the first place. Just ask Paul Plumeri, the area blues master who will be playing New Year’s Eve at the Alchemist & Barrister in Princeton. Plumeri, who turned 61 this month, started playing guitar as an 8-year-old, and once he discovered real blues as a young teenager, he never changed stylistic direction. The Trenton native — now Hamilton resident — says he got his first awareness of blues and rock ‘n’ roll in the late 1950s and early 1960s, seeing Elvis Presley, Ricky Nelson, James Burton, and Chuck Berry on television. Plumeri formed his first band, the Coachmen, when he was 13. Their first paying gig was a wedding. “We played Ventures music and whatever else we could figure out at that point,” he says, adding that out of all the members he is the only one to keep playing. Plumeri says his career was helped by having supportive parents who embraced both the new and often loud music and the changes occurring in the 1960s and early 1970s. “My dad and my mom were likely to be at all the various gigs I was at, with Duke Williams and the Extremes, with Hoochie Cooch, and with my trios. (My parents) weren’t prejudiced against long-haired people in any way. I think they were just amused by the whole scene,” he says, recalling the long hair he and fellow Trenton guitar titan Joe Zook sported in the early 1970s. The older Plumeri also had a wish: to bring minor league baseball to Trenton as a way to encourage a more favorable business climate. “He picked up my grandfather’s mantle because he was involved with a team, the Trenton Giants, and Willie Mays played on the team my grandfather was involved with. So my father always wanted to bring baseball back to Trenton,” he says. Plumeri’s father saw that wish come to fruition with the construction of the Route 29 waterfront baseball park. His hopes are enshrined in the Samuel J. Plumeri, Sr., statue at the stadium’s entrance. Plumeri completed a year at Mercer County Community College but the lure of easy money, a thousand dollars a week and more, playing five and six nights a week in Trenton and Shore-area clubs, proved too much a lure for him in the early 1970s. “Once they saw that music was my passion, and to some extent, calling, they just got behind it,” he says of a music career that involved touring the East Coast in the 1970s and playing with Capricorn Record-signed group Duke Williams and the Extremes into the early 1980s. 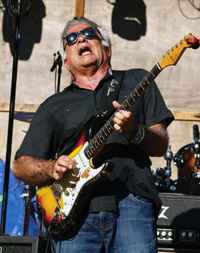 For much of the last 33 years, Plumeri has found the kind of blues and blues-rock he likes to play works best with a trio, so each musician has plenty of chances to stretch out and solo. “I look for guys who are very in sync with each other and can lay down a foundation for me to solo off of. They have to be locked in with each other. If they are, then it’s going to work for me,” he said. Indeed, proof that the trio format works for Plumeri can be found on “Live in Seattle,” an album he recorded at an old, wood-paneled, thousand seat theater in that city. Seattle was a second home for Plumeri for a number of years thanks to a friendly owner there who invited him out at least once a year for several nights of music. Plumeri’s other recordings, available through his website and in the few local record stores left in the area, include his 1995 debut, “The Bishop of the Blues”; “Blues in Disguise” released a few years back with harmonica player T.J. Nix; and “Live in Seattle,” released in 2001. Looking back at the Trenton-area music scene, Plumeri recalls meeting fellow area blues guitarist, bandleader, and singer-songwriter Joe Zook, who also left college at Trenton State to play in the clubs. Looking at the coming year, Plumeri says, “The guys I have now have been with me five years, and I’m really happy with them. They’re great guys and great players,” referring to bassist-vocalist Jerry Monk and drummer Marty Paglione. Other musicians frequently joining him include veteran Trenton-area tenor sax player Angelo DeBraccio. Area blues fans will meet some of them on New Year’s Eve at the Alchemist & Barrister, where the session will include a healthy dose of Plumeri’s originals — or co-writes with Trenton-native now Las Vegas-based singer-songwriter Tom Marolda — and “Auld Lang Syne” at midnight. Through nearly 50 years now of playing blues and blues-rock, the appeal of the music remains the same. More importantly, Plumeri’s enthusiasm for playing the music has diminished little. New Year’s Eve with Paul Plumeri, Alchemist & Barrister, 28 Witherspoon Street, Princeton. Thursday, December 31, 10 p.m. to midnight. No one under 21 admitted unless accompanied by a parent or guardian. 609-924-5555 or www.theaandb.com.